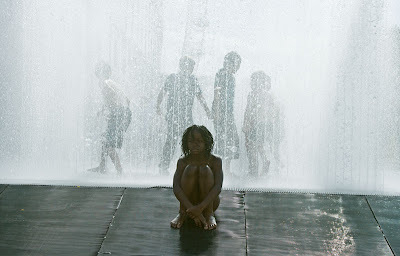 Each summer the water installation 'appearing rooms' by Danish artist Jeppe Hein is part of the summer fun on Southbank. You can leap from "room" to "room" as they appear and disappear and stay dry (if you are lucky). If you are a kid getting wet is what it's all about. That goes for the big kids as well. Like aliens arriving in a night-time swimming baths. I'd be one of the "big kids". I love playing the in the fountains and getting wet. Love the pic. That has to be the shot of the week, make that the year!!! What a great image. Beautiful. What a wonderful picture and a wonderful installation! Who wouldn't want to join in that kind of fun?! This is officially a BANGIN' picture! Superb shot, FUN and interesting to read. Very cool. Saw this a couple of years ago on a not-so-sunny day. There were a gruop of lads/chavs trying to look hard and not get wet. They failed - it was v funny! I can only agree - very good photo. So, did you manage to stay dry? Isn't this the square that is featured in 'Last chance Harvey' with Dustin Hoffmann and Emma Thompson? Saw the movie last week and promised myself to find that square. I think you just helped me there :) Thanks!